Technology integration refers to the use of advanced technology resources, such as computers, laptops, mobile devices (smartphones and tablets), digital cameras, the Internet and social media networking channels, software applications, etc., in routine classroom practices, and in the schoolmanagement. Successful technology integration can be achieved when the use of these technology resources is routine and transparent; easy accessible and readily available to students for the task at hand and supporting students to effectively meet their goals. When technology resources are effectively and successfully integrated into classroom setting, both the children and teachers donot stop to think that they are benefiting from using a technology tool, it is second nature. And students are frequently more energetically engaged in projects when advanced and sophisticated technology resources are an integral part of the learning process. The current article is all about the advanced Tablet Computers. In the following paragraphs of this, early table technology will be discussed. 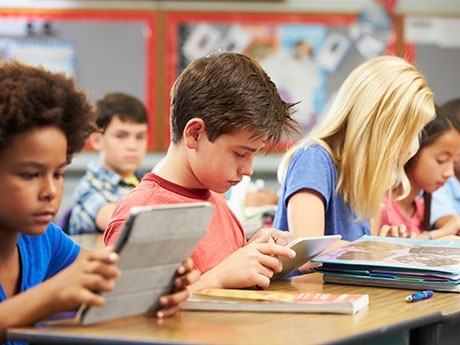 The article will then talk about the use of Tablet Computers and the ways in which this technology enhances the process of learning. The most important aspect of this article is its deployments in the schools, so the integration of tablet computers with the existing resources of ICT will be discussed in the end. There are many forms of Tablet Computing, ranging from a personal digital assistant (PDA) also known as a palmtop computer and handheld devices (handheld computer) to touch screen laptops, Slates, Tablet PC’s and newly introduced the ‘Post-PC’ Tablets. In the beginning, tablet computers were primarily forms of existing hardware and operating systems conforming to distinguish an additional input device, like a ‘pen’ or just a touchscreen. The Windows XP Tablet edition was released by Microsoft in early 2002 that support an advanced touchscreen laptop. A surface was developed by this that could be employed for direct input and frequently supported new functionality, like HWR (handwriting recognition). HWR is the capability of a computer to obtain and interpret comprehensible handwritten input from sources, like paper documents. Nevertheless, early tablet computers failed to gain acceptance worldwide, and conventional devices remained the first preference. Learning should never be technology led. Teachers are for teaching and technology is for assisting. This statement is imperative, but often disregarded. People should focus on how the learning can be assisted by the technology. The use of this technology type gives numerous advantages to students. The additional engagement is one of such advantages in which students can bring content through touch interface. A clear benefit for education is there to be obtained from better engagement, comprising it enhances stimulation, decreases the working time, and develops and improves the level of knowledge. Moreover, tablet technology has really transformed the concept of the use of information and communications technology (ICT), letting for further usage conditions and annexation in activities related to learning not formerly affiliated with ICT. An exceptional opportunity is provided by the tablet computers that gives people a portable experience of learning. Tablet computers have light weight and extended battery time, and they offer such possibilities that traditional ‘mobile’ computers do not. This is lent by itself to better technology use within the domain of teaching. As an instance, it gives a fast access to reference data while learning that was quite impossible in the past through the use of ICT. Tablets are now commonly used in less typical settings, like workshops, field trips or physical education lessons where people and students can conduct detailed research to accumulate authentic information with evidence and then present later. Integrating such state-of-the-art devices into the classroom environment for students is a good way to gain learning experience like Assignment Writing Service. An advanced and sophisticated tablet computer has the complete capability of delivering, like text and reference books, Web research, preparation and review of the document, resources of audio and video, and particular applications related to e-learning. In fact, this is really multipurpose tool. People should understand the ways in which tablet technologies integrate with the current ICT infrastructure. During the last few years, most of the schools have made considerable investment on the provisions of ICT and eLearning, so making sure the compatibility of the devices with these is crucial. At present, tablet producers focus primarily the consumer space, an individual user is being owned with each device. Therefore, it makes it quite difficult to provision technologies for use by manifold students whose capabilities are different with each other. In the schools, typical integration of tablet technologies are not well, therefore each individual device should be ‘shared’ that must be the focus of people. Complications are led by this while content, applications and resources are provided. So, one of the most important deliberations is locating an approach to let multiple students to access individualised content on each shared device. Tablet computers, in fact, have the capability to transform the means wherein the students deliver and consume the resources of eLearning. The adaptability and versatility of tablet computers are matchless, and its deployments in schools are growing rapidly in large quantities. Nevertheless, the needs of teaching should be fulfilled by technology. It is crucial to make sure that integrating any advanced and innovative technology into the educational setting ameliorates the furnishing of ICT resources, meets the needs of teachers and students and has plentiful advantages.